Not long ago, investigators at the Louisiana Social Services Department would spend hundreds of hours poring over documents to uncover evidence of food-stamp fraud. The department was buried under mountains of data from its electronic benefits system, which recorded transactions by individual recipients and retailers. State investigators had to review thousands of pages of printouts in their search for suspicious activity. But with a new Web-based system that can access transactional data and display it in a geographical context, department officials now can have that same information in their hands in about 30 minutes and review food stamp activity in a designated region or neighborhood. "This system allows me to go in and target a specific area and, in just a few minutes, pull together most of the information I need to identify a suspicious pattern of activity," said Raymond Pease, assistant director of the Fraud and Recovery Section of the Louisiana Department of Social Services. The ability to look at material in a geographic context gives investigators a fresh way to view data and reveals patterns and anomalies that might not be apparent in tabular data, Pease said. "You see new relationships that you didn't see before," he said. The Louisiana project embodies one of several trends in how government agencies are using geospatial technologies. Increasingly, state and local governments are integrating geographic information systems with other applications, such as data mining, supply-chain management and customer relationship management, to improve services. Government agencies also are combining geospatial technology with other so-called location-determination technologies, such as global positioning systems, radio frequency identification devices, network sensors and cellular networks. At the same time, the creation of geospatially enabled server platforms is facilitating the sharing of such data throughout the government enterprise. The net result will be increasing business opportunities for geospatial technology vendors and for integrators, said David Sonnen, IDC's senior consultant for spatial information management. "The integrators are going to be the driver to move this spatially enabled technology into the enterprise space. Clearly, the integrators have a major role there," he said. "It is not a trivial problem to bring these enterprise solutions platforms together with spatial technology with all of these location-specific data streams." 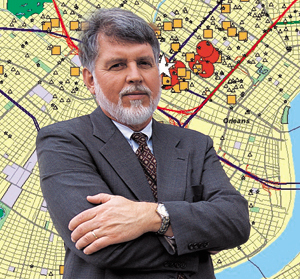 In Louisiana, the anti-fraud project marries business intelligence software from Information Builders Inc. of New York with GIS technology from Environmental Systems Research Institute Inc. of Redlands, Calif.
Because the agency has been using the system for less than a year, it doesn't have hard numbers yet to tout its success, Pease said. But the department has identified individuals with questionable transactions and is working with law enforcement agencies to prosecute those activities, he said. "There is a geographic element to every problem you have to analyze," said Michael Corcoran, Information Builders' vice president of strategy. To help government customers use GIS, the company has integrated its WebFocus business intelligence software, which Louisiana is using, and its iWay adapter software with ESRI's products, he said. "We've tightened the mapping interface between the mapping product and our product," he said. Geospatial technologies analyze and display data representing things such as roads, rivers, property lines and building footprints. GIS is a type of geospatial technology and consists of an information system or application that stores, manages or analyzes data that represents geospatial features and supports geocentric workflows. GIS can help emergency personnel track the location of their vehicles on a map in real time during an incident, and let law enforcement personnel see where the greatest number of crimes are being committed in their jurisdictions, so they can adjust their patrols. Worldwide spending on GIS software in 2004 was $1.8 billion, of which $544 million was spent by U.S. federal, state and local government agencies, according to market research firm IDC of Framingham, Mass. ESRI has roughly 80 percent of the software market share in the federal, state and local government space, Sonnen said. State, local and provincial governments account for 65 percent of government spending worldwide, and federal governments spend the rest, according to market research firm Daratech Inc. of Cambridge, Mass. Monica Schnitger, Daratech's senior vice president of market analysis, said GIS software sales to governmental organizations are growing about 10 percent annually. Steady U.S. government sales can be attributed partially to the incorporation of GIS into homeland security solutions, she said. Accompanying the growing software sales is a strong demand for GIS-related systems integration in the public sector, she said. This is true "especially in governments where databases abound with information that is not tied together," she said. Sonnen said growth during the next five years will center on tying together GIS with other applications or other location-determination technologies as well as incorporating it into IT infrastructure. This new activity in the market gives integrators a prime role in helping agencies take advantage of GIS technologies. IBM Corp., for example, is deploying its Websphere architecture as a key subcontractor to ESRI on the Interior Department's Geospatial One Stop-2 project, awarded in February. In addition to its work on GOS-2, IBM is a key subcontractor to Michael Baker Corp. of Moon Township, Pa., for the Federal Emergency Management Agency's five-year, $750 million Multi-Hazard Flood Map Modernization project, awarded last year. The company is providing support in the form of IT services, business process re-engineering, transformation, e-learning and call centers. IBM wants to assist other federal agencies to deploy geospatial technology across the enterprise, said David Beddoe, senior GIS product manager. "We're working with ESRI to move from departmental GIS implementation to enterprise GIS implementations," he said. Big Blue also does GIS-related work at the state and local level, Beddoe said. For example, the company is assisting San Francisco in applying geospatial technology for economic development as well as emergency management initiatives, he said. Another integrator, Science Applications International Corp., is helping the Michigan State Police integrate crisis management software that has a strong GIS component. The software maker is E Team Inc., a Los Angeles company that also has strategic relationships with IBM, CACI International Inc., ESRI, Microsoft Corp., Oracle Corp., Unisys Corp. and other IT companies. SAIC also is looking to combine GIS with other location technologies and build new partnerships to strengthen its offerings, said James Morentz, vice president for homeland security technology. He said SAIC has forged an alliance with Keyhole Corp., a subsidiary of Google Inc., Mountain View, Calif. Through its alliance with Keyhole, the company will be able to offer customers a database of mapping information and images collected from satellites and airplanes, he said. SAIC also is providing handheld, geospatial information that lets users visualize hidden elements of an incident scene to receive real-time operating procedures and to provide management with instant status updates of a job, he said. Plangraphics Inc. of Frankfort, Ky., has a solution known as spatial templates for emergency preparedness that lets workers extract GIS data from disparate databases and share it via a portal. The company has projects in New Jersey, New York, Ohio, Oregon and Rhode Island, as well as New York City, where its solution was refined based on experience gleaned from the Sept. 11, 2001, terrorist attacks, the company said. Plangraphics has formal and informal partnerships with Accenture Ltd., Alion Science and Technology Corp., CGI-AMS, Gray Hawk Systems Inc. and Oracle. Information Builders' iWay adaptive framework can extract information from upwards of 85 structured databases, Corcoran said. The company's expertise in fusing GIS with business intelligence applications has caught the eye of systems integrators such as Unisys. The two companies are discussing a partnership or alliance that would let Unisys leverage iWay on projects similar to its integrated criminal justice project for Volusia County, Fla., said Gerry Wethington, Unisys' vice president for public safety, justice and homeland security. The key for systems integrators that are exploring geospatial technology partnerships and alliances is to see whether the companies' technologies are compatible through common and open interfaces, Wethington said. "The thing you have to look for is a real match in terms of whether their technology and your technology are easily aligned," he said.